Leather making is a complicated process that takes about two weeks from start to finish. Tanned hides are dyed, slathered with conditioner and sealed with a protective coating to prevent drying and disintegration. Despite the protection, leather is still subject to staining after its manufacture into clothing, belts and other items, including shoes. Dark spots on a pair of leather shoes can seem nearly impossible to remove. But you probably have items on hand that can remove the dark stains and make your leather shoes look good as new. Sprinkle cornstarch on the stains. If grease has caused the dark spots, blot up as much as you can with a soft cloth. Sprinkle the cornstarch over the grease spots and allow it to remain on the grease overnight. Brush the cornstarch off the shoes in the morning, using a soft bristled brush. Wipe away cornstarch residue with a soft cloth. Remove dark ink spots from your leather shoes with mild soap. Dampen a soft cloth with water and add a squirt of dish soap. Rub the cloth over the leather until the ink disappears. Repeat if necessary. Clean dark mildew stains from leather shoes using a one-to-one ratio of isopropyl alcohol and water. Mix the alcohol and water in a spray bottle and spray the solution on a soft cloth. Rub the alcohol solution into the mildew stain until the mildew dissolves. Allow dark water stains to dry naturally. Blot up as much of the water as you can with a soft cloth and put the shoes in a cool area away from direct heat. If shoes are saturated, place shoe trees in the shoes to help them keep their shape and prevent shrinkage. Dissolve dark blood spots on leather shoes with 3 percent hydrogen peroxide. Dampen a soft cloth with the peroxide and dab the blood spots until the blood dissolves. 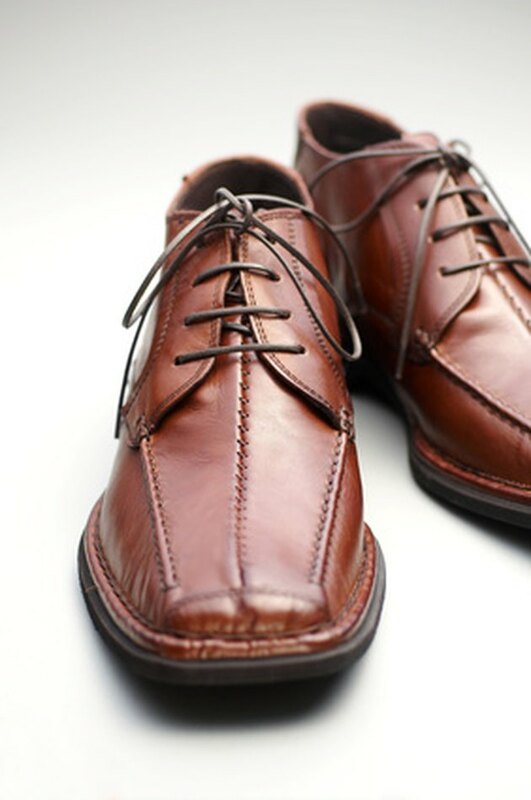 Spray your leather shoes with a leather protector to prevent dark stains from setting in the future. Do not completely saturate your leather shoes with any cleaning solution. Doing so can make the stain worse. Less is more when cleaning leather. MadSci Network: Re: How is animal skin made into leather(tanning)and how long does it take?